Manheim Remarketing's latest Market Analysis for Cars reports that overall average wholesale used car values increased by 1.1% (£77) to £6,813 in October following a drop of just 0.7% (£47) in September, with rises recorded in all three vehicle sectors. Average Fleet values increased by 1.7% (£76) to £6,036, Dealer part exchange prices rising by 0.5% (£12) to £2,231 and Manufacturer stock up by 1.1% (£131) to £12,188. When compared with January 2010 average values are 5.2% (£374) lower. Examples of increases in values for Fleet include Superminis up 9.2% (£299) to £3,535, Compact Executives up 3.0% (£237) to £8,154 and 4x4s up 6.7% (£784) to £12,427. At 47 months the average age of Fleet cars is four months higher than at the beginning of the year with mileage up by 6,237 over the same period. 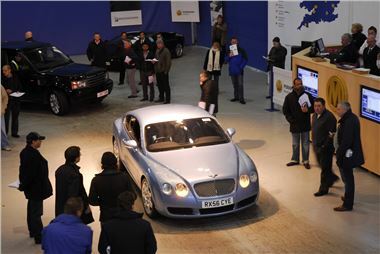 Dealer part exchange prices for Large Family increased by 6.1% (£103) to £1,791, Executives were up by 7.5% (£236) to £3,404 and 4x4s up by 1.5% (£78) to £5,199). Meanwhile Manufacturer stock values for Small Hatchbacks were up 6.4% (£523) to £8,681, Large Family up by 3.6% (£442) to £12,624 and MPVs up 2.2% (£279) to £12,890. Reductions in average values in the Fleet sector include Small Hatchbacks down by 0.9% (£38) to £4,142, Medium Family down 0.7% (£39) to £5,298, Mini MPVs down 1.9% (£92) to £4,830 and MPVs down 4.6% (£306) to £6,287. Dealer part exchange Small Hatchbacks fell in value by 3.1% (£58) to £1,810 and Compact Executives down by 4.0% (£137) to £3,259 meanwhile in the Manufacturer sector Compact Executives fell by 8.6% (£1336) to £14,106. Mike Pilkington, Managing Director, Manheim Remarketing said: "October has continued in much the same vein as September with no huge influx of volumes impacting on either pricing or conversion rates but buyers are becoming more selective with clean, low mileage and well specified vehicles attracting greater interest. We are now entering one of the toughest retail periods of the year for used cars and as the market eases into the early winter months and retail demand traditionally tails off, it is vital that vendors set realistic reserves to move stock quickly."